Metal Tornado is a Canadian scifi action movie which makes full use of the benefits of shooting north of the border in terms of representing the US on screen. I've read a few reviews that criticise the inappropriate or unrealistic city scapes and locations used and labelled as being in the United States (Ottowa/Ontario for Pennsylvania etc) but from outside looking in the lack of "well known" landmarks I had no issues accepting the movie slight of hand. A quick recap of the plot, a clean energy project using solar flare particles collectors in orbit which then process and beam microwaved energy to a ground station where it is then stored in huge capacity arrays for distribution runs into a few problems. The stubbornness of the corporate bosses and their lap dogs results in the problems being glossed over despite the side effects of huge amounts of energy going missing leads to catastrophic results and even more worrying there are multiple storage sites around the world. Lou Diamond Phillips and Nicole de Boer are if you will the good guys in the movie combining the scientific and action abilities required in this rather generic plot. Greg Evigan hams it up wonderfully as the boss of the project who refuses to see the connection between the experiments and resulting tornado and there are a number of familiar faces in support roles something which is common in Canadian productions more so around Vancouver. I'll admit I am a huge "b" movie fan and that extends from the out and out cheap as chips theatrical stuff from the golden era of scifi movies right through to the made for tv and straight to dvd scif/fantasy flicks which we get today. Yes many of them are wonderfully bizarre and freaky at times and always rely on the viewer to suspend their disbelief to a significant extent and Metal Tornado is no different. That said there is nothing really wrong with the idea behind this method of energy generation nor the side effects created with the flawed technology and combine that with well known corporate decision making you've got a plot that for me works very well. 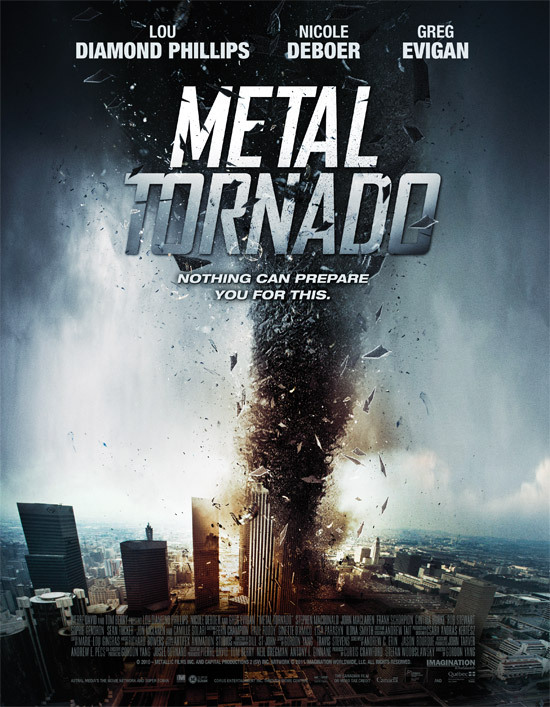 There is a genre out there that if you sit down with a certain expectation you will come away happy, Metal Tornado firmly sits in one such genre and in truth it's a good example of this type of movie, recommended for any fan of cheap and cheerful disaster/scifi movies.